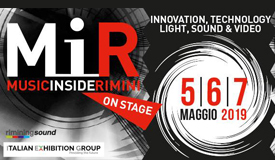 The event will take place in Rimini Fiera, Expo Centre from 5th to 7th of May 2019. After 3 very successfull editions everything is now ready for the 4th edition with an on-going increase in the content and exhibit space dedicated to Light&Sound, Professional Video, Integrated Systems and Music & DJ Producer. And with much more space for training and courses. Price for one night/one person. Breakfast included. 2 € Tourist Tax not included. – Lounge bar with free wi-fi. – Free Hotel room safes. – Parking space nearby the Hotel. – 15 min far from the Event location – Fiera di Rimini. Or ‘Book now’ through our form at your right side!